Here recently I have been privileged to interact with a leading brother who believes in God the Father and His pre-incarnate only begotten Son. While we discussed many interesting things I noted, during our conversation, that he seemed to have a bit of disdain for the doxology. And here on facebook, just a few days ago, another brother issued this interesting response to an EGW quote that positively referenced the doxology. No, sister White did not invite demons into the ranks by positively referring to the doxology. This is one of the extreme arguments that this forum is designed to correct. Therefore, in an effort to help this type of argument from being made again in the future, please let me share a few facts with you about the SDA pioneer view of the doxology. Praise Father, Son and Holy Ghost. [End Quote] Now it is beyond contesting that elder White did not ascribe to the doctrine of the trinity. Yet, as this picture evidences, neither did he have a problem singing the doxology. He actually included it for all SDAs to sing in the first hymnal and the church was clearly non-trinitarian back then. I would like to suggest to you friends that our pioneers were more broad minded in their understanding and application of the original foundation than some are today who claim to be standing upon it. This hymn is clearly not demonic and neither is its line about “praise Father, Son and Holy Ghost” ascribing any praise to the fallen cherub. We need to purge all such thinking from our minds. Now George Butler was not a trintiarian. He actually opposed J.H. Kellogg when he adopted a view of the holy Spirit as a separate person. And Uriah Smith is probably the most well known non-trintiarian of the SDA pioneers! Yet did you know that they both had a great deal to do with a SDA hymn book too? 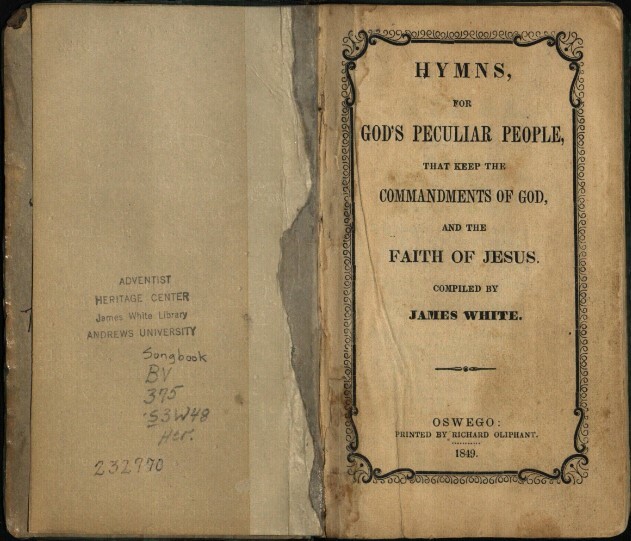 This one was made in 1886 and it is entitled “The Seventh-day Adventist Hymn and Tune Book” (see pics below-click to enlarge the images). I will also included a scan of the minutes for the 14th meeting of the General Conference on November 19th, 1884 where we can see when this was commissioned. “FOURTEENTH MEETING, NOVEMBER 19, 1884, 2:30 P.M. Prayer by Elder Haskell. Minutes of last meeting approved. The statistics of the different conferences were read for the purpose of correction. "1. That a committee of twenty-five, of whom Elder George I. Butler shall be chairman and Elder U. Smith secretary, shall be chosen to gather up both hymns and music, and each individual, after due examination of what he collects, shall send it to the secretary of the committee. "2. That there be a central committee of seven, with the same president and secretary, who shall examine all hymns and tunes sent to them, and shall have power to call to their aid such musical talent as may be needed to help them in their work; and this committee shall make a report at the next session of the General Conference of the progress made toward a new hymn book. "3. We suggest the following names for the committee of twenty-five: George I. Butler, S. N. Haskell, Uriah Smith, J. H. Waggoner, W. C. White, Charles Jones, S. Brownsberger, W. H. Littlejohn, J. E. White, C. C. Lewis, Professor E. Barnes, Frank Belden, B. L. Whitney, O. A. Olsen, G. C. Tenney, E. W. Farnsworth, L. McCoy, R. M. Kilgore, E. W. Whitney, R. F. Cottrell, D. B. Oviatt, D. A. Robinson, A. J. Cudney, J. G. Matteson, M. C. Wilcox. Now, at this point in time in SDA history, the view of the brethren was clearly non-trinitarian. Yet guess what song they included in the hymnal? You guessed it! The doxology. It’s on pg 256. You can see it for yourself (see picture attached). So then does this mean that they had become trinitarians? No, it does not. In fact on pg 99 of this same hymnal they changed the last line of the song “Holy, holy, holy” from reading “God in three persons, blessed trinity” to reading “God over all, who rules eternity” (see attached photo). This is a clear evidence that they still did not acribe to the sdoctrine of the trinity but even so, were quite comfortable singing a hymn of praise to Father, Son and Spirit collectively. Cover sheet of Review and Herald where Uriah Smith's defense of doxology is found (click to enlarge). Uriah Smith-Apology as it appears on the publication (click to enlarge). “Do the Scriptures warrant the praise or worship of the Holy Spirit? If not, does not the last line of the doxology contain an unscriptural sentiment? D. H.
So Uriah Smith himself defended the usage of doxology on the basis of the formula for baptism in Matthew 28:19. If the holy Spirit could be associated with Father and Son there, he argued, then why could it not properly stand as a part of the same trinity in the hymn of praise? A reasonable argument if I’ve ever heard one. Note: Please note that this was a generic usage of the word “trinity” and not the creedal doctrine or even the doctrine held by the SDA church today. Even after this quote, Uriah Smith still upheld begotten theology and taught a doctrine that he called the “evolution of the deity.” I can prove that if anyone doubts it. Now here we will look at the view of an inspired author. The pen of inspiration has several references to the doxology. Starting page of EGW's Review and Herald, January 4th, 1881 article. That has clear implications for how we relate to the heavenly trio doesn’t it? Brothers and sisters in Jesus, I would suggest to you that the SDA pioneers had broad minds and were not narrow in their thinking. If we really want to return to their position then let us do so indeed, including their broad-mindedness! Please think about it. When you go to worship God and His Son corporately, whether it is in a building designated for worship, like a church, or within a home fellowship, do you just approach it any old way? Or do you believe in demonstrating reverence as you enter into house of God? And if you say the latter then why? Are you in the physical or tangible presence of God or Christ? No, for They are in heaven! So then what presence is there with you that compels such reverence? Is it not the spiritual presence of God and Christ by the holy Spirit? And if you will show such reverence due to the presence of the holy Spirit of God then why in the world would you say that to sing a hymn of praise that includes It, along with Father and Son, is demonic? Isn’t that illogical? Based on the quotes, I feel safe to say, that the SDA pioneers mentioned above would certainly view it that way. So therefore let us have liberty on this matter. If you cannot sing the doxology, in good conscience, because you cannot find praise for the holy Spirit within the Bible and/or because you know that many have a false conception of God when they sing it, then so be it. Those are valid and good reasons not to sing it. Yet, let us simultaneously give liberty to those who do wish to sing it because they find it explicit within the testimonies and because they have a clear and definite conception of the heavenly trio that does not negate God the Father as the great Source of all, His only begotten Son as the receiver of all things, and the mysteriously-natured holy Spirit as the omnipresent personal representative of Them Both. Older PostUnderstanding the Word, "Godhead"